In its heyday, Baby Duck was a very successful product. It is a sweet, fuzzy wine modeled after Mateus, the popular wine of Portugal. In 1952, Brights Wines purchased the Fred Marsh Wine Company. At this time, the Fred Marsh winery was working on developing a sweet sparkling wine. It was introduced to the market as Brights Winette. They used Labrusca grapes which could be obtained rather cheaply. This allowed Brights Winette to be sold at a low price. Brights had control of the Sparkling wine market until Andrew Peller of Peller Estate Winery decided to enter this market, creating a line of Chanté wines. 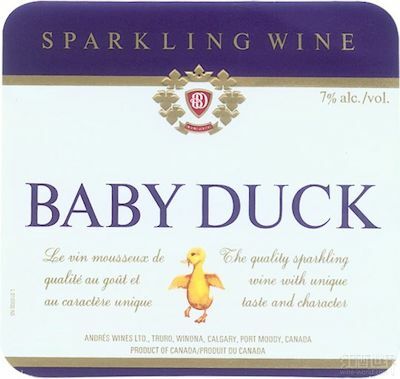 In 1971, they created Baby Duck, a soft-drink-sweet blend of red and white Chanté wines. 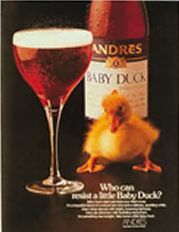 Created at the Andrés Wines Port Moody winery in 1971, Baby Duck was the best-selling domestic wine in Canada during that decade. The idea was not original. Several American wineries in the 1960s had become quite successful with sparkling pink wines called Cold Duck. (The name comes from an old European tradition of combining the remains from all the wines at a party in a single bowl and calling the result the cold end; the German “kalte ende” sounds like cold duck.) When Andrés copied it in Canada in the mid-1960s, it was a huge success even though Joseph Peller, then the winery's president, "could not believe it was a serious beverage." Cold Duck had 12% alcohol. Andrés cleverly finished Baby Duck with seven per cent alcohol because the lower alcohol meant lower taxes and thus a cheaper wine. The grapey flavours and sweetness appealed to palates of the day. Andrés advertised it heavily on television, even hiring an animal psychologist to advise how the ducklings should behave in the commercials. 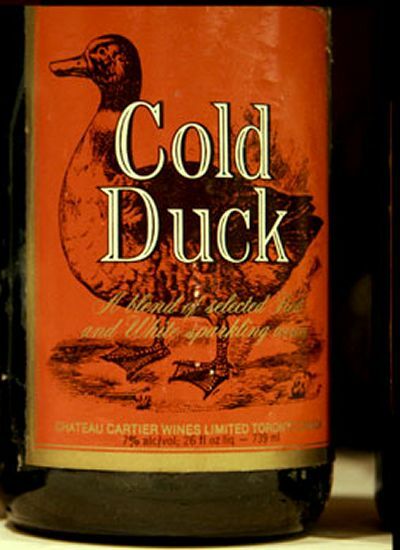 Hugely successful, Baby Duck was the best-selling domestic wine during the 1970s and it hatched numerous imitators: Canada Duck, Love-A-Duck, Kool Duck, Daddy Duck and Fuddle Duck were joined by Cold Turkey, etc… All of these wines driving the runaway expansion in the wine trade in the 1960s and 1970s were concocted from water, sugar and grapes that were judged unsuitable for making good quality dry table wines. Baby Duck peaked in 1973, selling over 8 million bottles. Many people believe its popularity had to do with its easy-to-pronounce name. Baby Duck was originally made from “musky” native labrusca varieties such as concord and bath - and Andrés simply couldn't get enough of them. As well as encouraging local grape growers to plant more of these high-yielding and hardy varieties, B.C. wineries were obliged to import grapes and inexpensive finished wines from California. The Canadian success of the wine led Andrés to export it to Britain in 1979. Despite a $2.5 million advertising campaign there, Baby Duck flopped in Britain. In its review, the London Sunday Times wrote: "The drink [is] purple, sparkling stuff [that] tastes like black currant wine gum dissolved in a glass of Andrews Liver Salt. Served extremely cold -- preferably on a stick -- you might be amused by its presumption." However, Baby Duck made so much money in Canada that Andrés, now Andrew Peller Ltd., expanded nationally and is today Canada’s largest shareholder-owned wine company. The wineries it owns make a lot of serious Canadian wine. 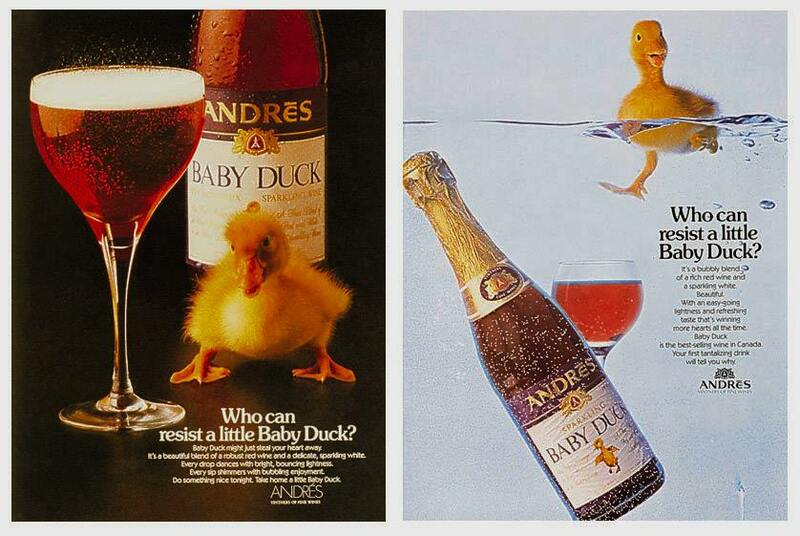 Andrés still produces Baby Duck with 7% alcohol In 1980, Andrés downgraded it from Wine to A Refreshment drink. ~ In 1962 Ben Ginter bought Caribou Brewing Company in Prince George. He renamed it Tartan Industry Ltd. In 1970 he took over a nearly bankrupt Mission Hills Winery changing the name to Uncle Ben's Gourmet Wines Ltd. Trying to compete with Baby Duck he came up with Fuddle Duck and weird name wines. ~ In 1975, there were 3315 imported wines in Canada and only 1875 domestic products. ~ In 1975, the big four Wine producers were Andrés, Brights Château Gai and Jordon. ~ Moody Blue was launched in August 1974 by Andrés and was named for the band... Moody Blues.